During our recent trip to Detroit for the Movement Electronic Music Festival we caught up with Kyle Hall for a chat about music production, workflow inspirations, and his Wild Oats label. 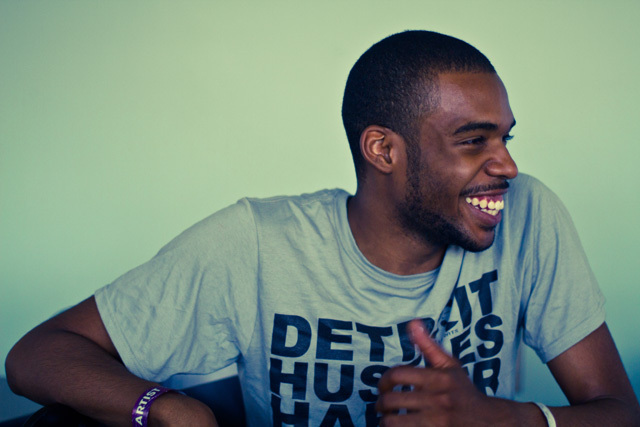 Kyle Hall is a talented young producer from Detroit who took 2011 by storm, appearing on everyone’s radar with a steady stream of original tracks and remixes that displayed his knack for off-kilter house rhythms and complex chords. He’s the product of Detroit’s rich musical heritage and straight-up hard work, an inspiration to many up-and-coming producers with his down-to-earth attitude. 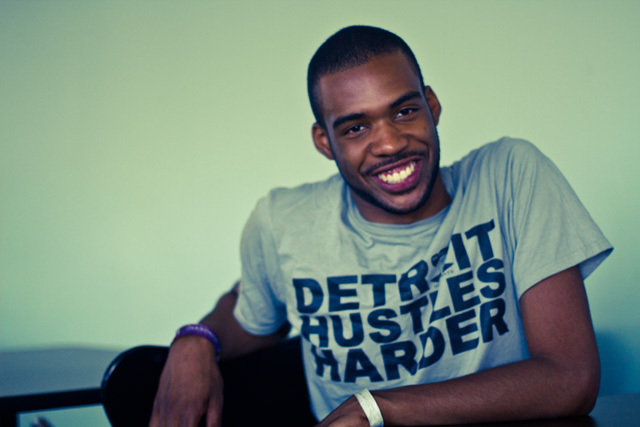 We caught up with Hall for an interview during our visit to Detroit’s Movement festival. Michael Walsh: I know everyone asks this but, how old are you, if you don’t mind me asking? MW: That’s something I keep hearing about you as a young prodigy from Detroit, how old were you when you started doing this? MW: Mike (Huckaby) was saying you went to Youthville? KH: Yeah, I first started to attend when I was about 13, I met Mike through another cat by the name of Alvin Hill who was teaching and running the music production program there. So at that point when I met Mike I was already DJing and already kinda making music, going through his class getting further direction and things like that. MW: I’m curious about the education side of it, did his class take you to different levels and places? KH: Yeah, he definitely presented a lot of new ways and thoughts about programming sounds and sound designing things. That’s what kinda got me into that at that point. I was buying a lot of experimental records and things like that so my brain was already there. MW: Are you a trained musician? KH: No, but I did take music theory at school, I wouldn’t call myself a instrumentalist but I’m familiar with it all, how to form music and things like that. MW: I saw a YouTube video of you playing at school on the stairs with a keyboard, and I thought, “This dude knows how to play!” How do you get the point where you can play that quick? Do you just take piano lessons or practice or study music theory? KH: I was never the guy that wanted to learn to play other guys’ music, learn how to play songs and things like that. I just liked certain tonalities and hearing certain harmonics come out of instruments and that what’s kinda drove me to synthesizers a lot too. So I guess my ears as a producer and things like that are more into pulling things that have a goal in mind. Like I want you to feel a certain thing from one note to another or just how things are placed together. The more I produce the more mature I get with my production. Like I’m starting to get that in my head more. MW: Can you give me an example of one of those goals might be? KH: Yeah like for instance rhythmically, that’s another big thing, and tonality of drum sounds, a lot of people don’t think about that. Like the tone of your percussive sounds also effects your overall flow and the continuity of the track. So just like sometimes, tuning your snares and things like that. Tuning your little rimshots and not only tuning but pushing things to the right, nudging kind of so you get a different feeling of how things fall. So that’s one thing I always have, so if I want something to have more of like a loose feel, I’ll tend to drag my hihats a little bit further ahead, throw them a little off the grid. It’s not so much about making things purposely off beat or anything like that. You gotta think about it like its actually music, like “how is it supposed to fall?” A lot of people think about those things in the context of DJing and I generally don’t do that, you know? Some people are scared its going to throw the whole beat off, but I’m thinking “No, if everything’s relative to each other, it’s not going to throw it off!” It’s about the relative space between sounds and the movement and like tonalities. That’s just one example just percussively and the same thing kind of applies when you think harmonically and view your chords and sounds playing on each other, things that are still dissonant or things that feel very harmonious. KH: Yeah, just like running over things, rolling over some dissonance and then giving you something good, continuing to delay the gratification. That’s what it is. Keeps you wanting more. Like Kerri Chandler, his stuff never resolves. It goes up, up — it never resolves. MW: Did you learn this on your own or did someone teach you this method of making house tracks? KH: It goes back to tastes I have, things I like. Artists like Blaze. I see the elements they use. Like old Blaze or the Casio Ware stuff. I look at the elements they use. I noticed the chords are really simple jazz seventh chords or chromatic up and down chords. If you just have those things by themselves they are kinda empty, so to make up for it they play pentatonic scale solos and stuff. Cats like Bugz in the Attic do a lot of nice transitions where there’ll be a bridge going up a fifth to give you that elevated thing. Some cats will stick to the main groove of the chord and just go off on it . MW: Now, in seeing you play and talking to you here, I get the impression that you think in terms of the piano. (Kyle has been playing the table for the last few minutes as we talk). KH: (Laughs) Yeah, yeah, yeah. Sometimes you gotta feel it out, see where it needs to go (plays the table). That’s how I think when I make a track. By no means am I a maestro. These are just things that I picked up and this is part of my education, part of me moving forward to learn music. I’ll stop for a minute. I’m trying to learn more stuff. That’s why I’m not putting out as much (music) as last year. MW: Does DJing affect your flow of production? KH: Yeah, when you’re DJing a lot it can subtract from your production and learning time. In my head everything has a process of putting things together and when I’m DJing I have a routine within myself for hunting for music and that is totally different than making music. My ear has changed, my preferences change between DJing and making music. When you’re in production mode you’re thinking of a singular project, thinking about the process at hand. More details. MW: Tell me about your Wild Oats label and what’s up for 2012. The last record that I just put out is an Emanuel Gonzalez record. It’s his first release on Wild Oats. It’s kind of like a heavy tape-saturated dubby techno kind of affair. I played it at St. Andrews last night at the KMS party and…man! And there’s another guy called Gifted and Blessed from LA who’s really good that’s coming out on Wild Oats. MW: When you say tape do you mean reel-to-reel or cassette? KH: Cassette. He recorded this on cassette straight from his Yamaha drum machine. We’re definitely into the lo-fi side of things. Sometimes you need that noise, that buffer. It’s like makeup on a girl. Outboard processing is something I’m really into. MW: Do you have any new music coming out in the near future? KH: I’ve been doing a lot of collaborations lately. The next thing I’m getting mastered this weekend is a project with me and another producer from London called Funkineven. We did that over there in London. One of the tracks in one of our friends’ bedrooms. We were actually trying to show him how to use the MPC and the MC 303 and he was like “Why don’t you just record that?” (Laughs) I was just trying to show him some MPC tips. We’ve been playing it for about a year now. We did some other stuff together that’s coming out on Wild Oats.